Jack decided he really liked it (husbands don't, as a rule, wax poetic about things we make) so...it will become a throw for the back of our couch. Then he announced that it would be really nice if I were to make two smaller ones to go over the back of our chairs too. Hmmm. Well, this morning I cut out more denim and have one sewn up already. Pattern for the quilt is from HERE. It's an adaptation of Kaffe Fasset's Jewel Squares from the book 'Glorious Patchwork'. Each year I make a special ornament for Christmas giving - generally in editions of about 24. Some are little gifties themselves and others are used as 'tags' on larger gifts. Yes, you're not seeing things - that IS a paper clip!! Most of you will remember my monthly TUSAL (Totally Useless Stitch A Long) posts over the past year. It was such a fun project and I enjoyed seeing my ORT (Old Recycled Threads) jar fill up as the year progressed. Well, DaffyCat has decided to run it again in 2013 and I've signed on once again. Thanks to her instructions I've been able to snag her 'button' and put it in my sidebar. You can click on it to go directly to her post about this fun project or you can go HERE to read all about it. Please consider joining in because, after all, we ALL need a little something that's totally useless in our lives!! I have to show you the beautiful arrangement of flowers that just arrived at our door! Aren't they lovely? It's a great mystery as to who sent them though! The card was simply signed 'the gang'. Ummm. We don't know a 'gang'....or do we? Never mind, they are exquisite and we will enjoy every moment of having them. Thank you to 'the gang', whoever and wherever you may be!! to all his online kitty friends too! if this pile of ORTS is an indication! ....yep, a miserable cold has caught up with me and I'm doing nothing but dose myself with Buckley's and seriously consider buying stocks in the facial tissue business. Good thing I have a comfie chair, a doting husband, and lots of no-brainer Christmas movies on TV! 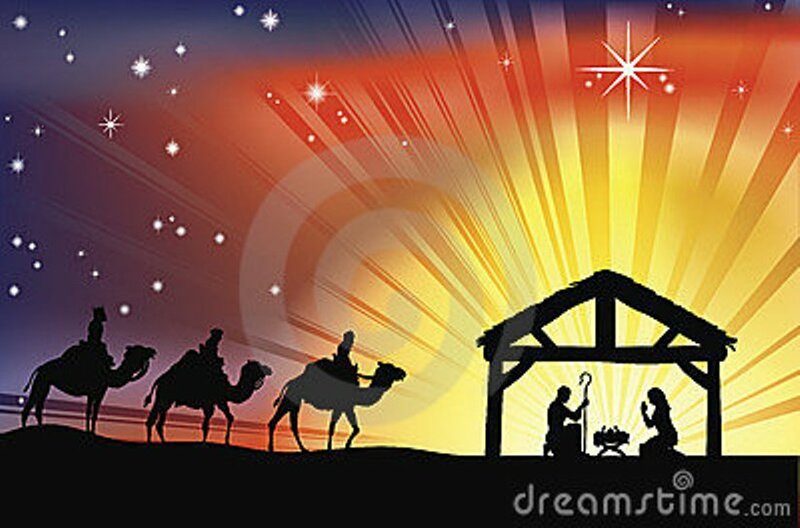 Normally I save putting up an image of my creche until closer to Christmas. I know I post it every year and perhaps my long-time readers are rather tired of seeing it. The news from Connecticut today is beyond comprehension and is so very heart-breaking. All I can do is pray for those families and publish an image of what I believe in and know that God is with them. 1. The Drops yarn site has a daily free pattern for the month of December HERE. There are some fun things on there already and I'm sure there are more to come. 2. More free knitting patterns HERE at the Vogue Knitting site. Be sure to scroll down, because there are lots of goodies available. 3. Further on the knitting scene, the newest issue of Knitty is up. Go here. 4. And, for a change of pace, have a look at the lovely crazy quilted tree skirt that Arlene has made. Go HERE. I'm not sure that the pattern is still available. What's if for, you say? it's for the recipient to decide! It measures about 5 inches high. If you are interested in making your own, let me know and I would be happy to put a tutorial on here. But then again....maybe you're not. Interested, that is. Doesn't everybody need a pod?? Above shows the hussif folded. for even more storage of sewing treasures. and now it's on to # 2!! The other day something wonderful arrived in my mail box and to say I was thrilled is an understatement. Most of you know that I collect books about embroidery so this was a most welcome addition to my treasures (thank you Lyn!!). Such a sweet little book and a definite gem to own! There is a free on-line version of the Altered Arts magazine available HERE if you are interested in having a peek. Today I finished the stitching on the outside of this hussif. This will be the one I will be using in the workshop I'm teaching. Now it's on to designing the inside where all the goodies will be held. I *think* I know what I want to do, but it remains to be seen if it will actually work. This being a designer isn't easy!! 1. Pam Kellogg has issued her 'Crazy Quilt Strawberry Ornaments' booklet on MagCloud. You can check it out (and see a preview) HERE. These would be beautiful on a Christmas tree or as a lovely ornament to leave out all year. 2. 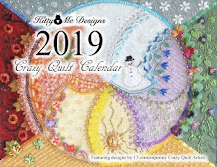 Pat Winter has the new Winter 2012 issue of the 'Crazy Quilt Gatherings' magazine available now and, as always, it looks like a winner. I've ordered mine...can't wait! This time, if you order the print version, you can get the digital version for free!! Go HERE. Suzy has made the most gorgeous (understatement!!) scarf for the Pink Scarf Project and has posted pictures on her blog. Oh my - her work is beyond beautiful!!! Go HERE to see and be sure you scroll down to see all the exquisite detail. The picture of the cowls (above) isn't all that wonderful - too bad I don't have a mannequin to 'model' for me! This was a really simple pattern - The Button Up Neck Warmer, a free pattern from Red Heart (www.redheart.com). Fingerless gloves aren't all that exciting either, but they were fun to knit. The pattern is called 'Jeff's Mitts' by Lorraine Ehrlinger Designs. I *think* I found it as a free download on Ravelry, but can't remember for sure. This is the start of a second hussif. 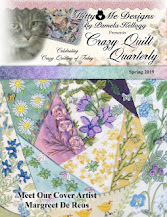 I have been asked to teach a workshop for our local quilt guild in February on crazy quilting. Gulp!! The one I showed you yesterday will be embellished in my usual style, whereas this one will be a bit more subdued and will be the basis for the workshop class. This will be evolving as I go along into something I hope will prove to be a workable pattern. It's actually 1/4 inch painter's tape and is one of the move invaluable tools I have in my stitching arsenal. Maybe I shouldn't tell you about it because it will spoil all your illusions that I have a straight eye (oops). Anyway....it serves as a great measuring tool and helps to keep my stitches more-or-less the same size and relatively straight. It's found in the painting section of the hardware store and is marketed as 'painter's tape'. ***Don't make the mistake of getting regular masking tape because it leaves a residue on your fabric which, in turn, grabs up dirt and looks grubby in no time. *** Painter's tape is quite inexpensive and a roll will last a long time. It's also reusable several times over. This is the start of another crazy quilt project - actually one of two. This will turn into a hussif (if all goes well!) once I'm done. CAN READ THE FUN POEM SUZ WROTE!! Yes, the big mystery is over. All the rest came from my stash. p.s. click to embiggen if you'd like! I'm sorry to have to put the word verification back on for a little bit. I'm getting inundated with spam and hopefully they'll move on to greener pastures when they discover that it's harder to be a PIA. In the meantime, please keep commenting and I'll soon return things to the regularly scheduled programming (I hope!!). I did manage some stitching today but haven't had a chance to take any pictures. However, I can tell you that the unveil of the grant secret project is coming soon. Stay tuned!! I've been away all day, so very little done on the stitching front. This was a piece that I finished yesterday. It's easy to see that I've been working a lot with pink and green! Today I removed some of the pretties on the sweater and they, in turn, evolved into the little area of embellishment below. Outside it's dreary...raining and everything just looks brown and depressing. Fall has gone from being glorious to the prelude to winter. Tonight it's supposed to get cold. B-r-r-rrrr. Inside, I'm stitching (which is great medicine for dreariness). See?? I do love working with waste canvas! much done in the way of stitching. incredible denim pieces of art!! Isn't that the cutest little tree? enough to cover the seam.